I’m pleased to have Carol Bodensteiner join us this month. But, in the interest of full disclosure, I will admit that for nearly the first year that I was active in social media, I got Carol confused with Shirley Showalter. They both wrote memoirs of growing up on a farm, both had blonde profile pictures, and both were from somewhere west of me. 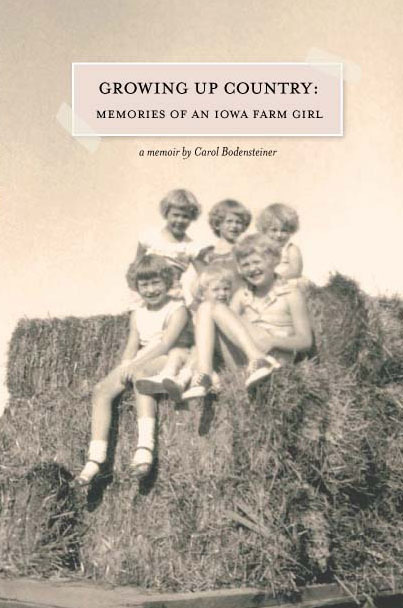 But I’d read Carol’s memoir, Growing Up Country: Memories of an Iowa Farm Girl early on, so when Shirley announced the launch of her book, Blush, earlier this year, and I realized she’d grown up in Lancaster, PA, I figured it out. I came to see these two remarkable women for what they truly are: twins, separated at birth. “Turn of the century?” you ask. I’m talking about the century that turned long before any of us joined the party, not the one that added Y2K to our vocabulary. This is one of my very favorite book covers. I love to feature stories of negotiating borders and Going Away Home tells the story of Liddie, a young woman caught between two worlds. Maneuvering between them, Liddie finds, is not always easy. Carol tells a similar story in this reminiscence of finding her path to a new world. And back again. Take it away, Carol. (You’ll find her bio at the end this time). I failed the driving portion of the exam to get my driver’s license three times. Yep. Three times. The officer who gave the driving exam was a stickler for parallel parking, a task to be accomplished between two police cars. Since I couldn’t negotiate my car into that space to his satisfaction, he failed me. Again. And again. Since the exam was only given once a month in our county seat, failing was a big deal. After the first failure, I begged. I pleaded. Finally, Mom took me to the next county. Where I failed again. Mom was not amused since it was she who had to shuttle me from testing station to testing station. That surely wasn’t what I wanted for her. My driver’s license was a ticket to freedom – for her and for me. Without a driver’s license, I was at the mercy of someone else to get me places. Since my parents were tethered to the farm morning and night by the dairy cows, without a license, I was equally confined. With my driver’s license, the world of high school extracurricular activities opened up – cheerleading, class plays, track meets, speech and choral contests. There was little I didn’t want to try. I actually do not remember consciously wanting to leave the farm. In fact, I loved the farm as anyone who’s read my memoir Growing Up Country will know. It was the opportunity that opened up with a license. I thought about that desire to leave one place and get to another a lot as I wrote my novel Go Away Home, scheduled to be published in July. In the years encompassing World War One — when my novel is set — opportunities for women were limited. A track that included marriage, home, and children — in that order — was both expected and honorable. Prior to marriage, a woman might teach, but even that career was abandoned once a woman tied the knot. A woman effectively went from her parents making decisions for her to her husband making decisions for her. Even though the suffragettes were campaigning for a woman’s right to vote, it was from the safe confines of marriage, home and children. Farm women were particularly isolated, by distance from neighbors, by the demands of farm work, by the lack of mass communication, by the lack of easy transportation. My main character, Liddie Treadway, wants a different path for herself. She wants to have a career, to make her own decisions. She is accomplished with a needle and aspires to apprentice for a seamstress in the county seat, learn the trade, and make her own future at that. Sans husband. But first she has to get off the farm. Just as it was for me, transportation is both Liddie’s way off the farm and her barrier. She could live on the farm and take the train into town. Except that it is unseemly for a young woman to travel alone on the train. Her father would never approve. She could take a buggy into town. If her brother drives her. Once she’s in town, she can only get back home if her brother picks her up. Liddie could empathize with Syrian women today. Gradually, Liddie takes control of her life and of transportation. Once she is able to experience the world she’s dreamed of, Liddie is enthralled with her independence, a new-found passion for photography, and the man who teaches her. Yet, the family, friends, and life of her youth tug at her heart, and she must face the reality that life is not as simple, or the choices as clear-cut, as she once imagined. She learns, — as many of us do — that there’s often a conflict between dreams and reality, and getting what we want can sometimes be a two-edged sword. Once I had my driver’s license, the borders on my world fell away. Throughout my life, I’ve enjoyed traveling. Once I could go anywhere, though, I learned something else equally important. When I could freely leave, coming home was all that much sweeter. Carol Bodensteiner is a writer who finds inspiration in the places, people, culture and history of the Midwest. After a successful career in public relations consulting, she turned to creative writing. She blogs about writing, her prairie, gardening, and whatever in life interests her at the moment at www.carolbodensteiner.com She published her memoir GROWING UP COUNTRY in 2008. She has had essays published in several anthologies. Her debut novel, GO AWAY HOME, historical fiction set during World War I, will be published in July 2014. Carol, thanks so much for giving us a brief but poignant glimpse into your new book, Go Away Home. I loved the way you anchored it with your own story of growing mobility. As I read it, I couldn’t help but remember my own impatience in getting my license. What about you? As you look back, what memories come to mind of your transition from dependent youth to independent adult? Did transportation figure in your transition? Janet, Thanks for inviting me to your blog. Your exploration of moving between cultures gave me a new way to think about both my memoir and my upcoming novel. Carol, I’m so glad. I like to think that these transitions we make across various boundaries (cultural and others) is what we call “life” — one continuous transition from one place to another, whether physically, emotionally, psychologically, or spiritually. (No wonder I’m so tired). Cheers. Glad to have you here. Janet, I started smiling when you admitted to the confusion between two writers growing up on dairy farms though in different states. Carol’s profile photo is still blonde, but Shirley’s is different now. No matter – you have it all straightened out. Like you, one of the times involved inability to parallel park properly. As for your new book, transportation is such an appropriate metaphor for a coming-of-age story, particularly so in that era. Best wishes in all the promotion that goes with it. Your writing style is engaging, Carol, and I know I will enjoy beginning with your first book. In fact, I’m off to order it right now. Thanks to both of you for your contribution to this fascinating post. I like making you smile, Marian. Hadn’t thought of the twin angle until I was putting this all together. Made me smile too. Thanks for being such a faithful villager. Okay, Janet. You can’t tease us like that and not share the parallel parking trick. Spill! 1. You pull up parallel to the car in front of the spot, close enough that a passenger in your car can’t get out. 2. Back up enough to turn the back of your car into the slot and LOOK out your side mirrow. 3. Keep backing up (and turning sharply into the spot) until you see the right front wheel of the car behind you in your side mirrow. 4. Then straighten your wheel and finish backing in. You might need to pull forward in the spot just a bit to be perfect. Do you have any other way? (the trick, really, is waiting until you see that car behind you in the mirror) before you try to straighten out. I hadn’t heard the part about seeing the right wheel of the car behind. Everything up to then I do. Glad to have another tip. Thanks! Marian, I agree – flunking that test was a moment of extreme emotion. It sure has made a good story over the years, though. I’m glad my style appeals to you. Thanks for looking into my memoir. Ha ha ha. I can only imagine how hard it is to tell Carol and me apart when the most salient fact you know about is our mutual origin on dairy farms. However, as Marian pointed out above, only one of us is now or has ever been blonde. And that one is Carol. I’ve read both books and truly admire Carol’s ability with language and structure. I also like her subject matter in both books. I proudly passed my own driver’s exam on the first try. But it could be that I didn’t have to parallel park. I can’t remember. What I do remember, however, is that feeling of freedom afterward. When my father bought me a convertible, he may very well have created the first Mennonite in a Little Black Convertible. And Janet, you tickle me, as the saying went in our household. Thanks for twinning me with Carol. I’m honored. I’ve felt a kinship with you, Shirley, ever since I learned you were a dairy farmer’s daughter. I welcome you as a sister – in the dairy barn, in the writing world, even on Amtrak if you’d let me! Now I really feel like I am sitting at your kitchen table, Janet, as you gather us to share these border stories! I never thought of Shirley and Carol as being twins but certainly have enjoyed their tales of farm life. I still hate to parallel park and can recall the agony of those driving tests. Carol, I loved both your books. You writing is eloquent and heartwarming. It sweeps me away and connects me with family values and a simpler time. Thank you both for a delightful post. Cream and sugar? And I offer decaf as well. Always good you have you at my table, Kathy. Thank you for reading and commenting so favorably on my books, Kathy. I’m honored and humbled. Though I still consider myself an expert at parallel parking – after my inauspicious start – it looks as though technology will soon save us all by letting the cars do it on their own. And I, for one, will let them. I don’t remember transportation being a problem while growing up. We lived on a working farm, with 5 families on co-joined properties. But my maternal grandparents (carpenter and cashier)did not farm, neither did my parents (teachers). We took the bus to school, getting on at the bus stop with sometimes 15-20 of us cousins at once. I suppose my siblings and I could have ridden in with our parents to school but that could have been more embarrassing than being plain, though most of us were just fine with plain. So we actually had 2 cars, something I noticed many families did not in the 60’s and early 70’s. Our second car was a brand new 1970 Toyota and boy, did we get the kidding from the families…does that have a rubber band to wind it up? Is there a hamster and wheel for an engine? Everyone else was driving the big Fords and Oldsmobiles. But my mother stuck with little cars from then on. They worked in 2 different school systems so they did not carpool. Once we got our license (I was the oldest in my family) it wasn’t as if we used the cars much. We still took the bus and as for after school we either arranged to ride home with a cousin if they had use of a car or we arranged with a parent (usually our father) to wait for us and brings us home after. But we had a tendency to hang together…we all went to German Club, we all did Honor Society, all did FFA or FHA etc. My children did that too in school…all did cross country, all did German Club AND Spanish Club, all Honor Society…only one girl did FFA and she’s now our throwback farmer girl. Hmm, and I never learned to drive a tractor, though my 4 brothers all did…they helped the uncles when needed. My one sister married a farmer and I know she can drive a tractor. Hi, Athanasia, Since we had no brothers, we girls were all pressed into service on the tractors. I know I always felt important when I stepped up to drive. Our second “car” was the 1947 Studebaker pick-up truck used for all farm chores. I drove the truck to town for cheerleading and to friends’ houses for parties. After I had two small accidents with the truck, Dad bought a real second car for my sisters and me to drive to our school activities. We never asked for a car. I wonder if he was afraid of using the use of his truck if one of our mishaps was more major? I do read the Urban Organic Gardener, Mike Lieberman’s site, if that is what you refer to. But that is all. I like all the container gardening ideas.